The intersection of Harbinger Lane and Ferry Road at Austins Ferry marks one corner of Weston Park. 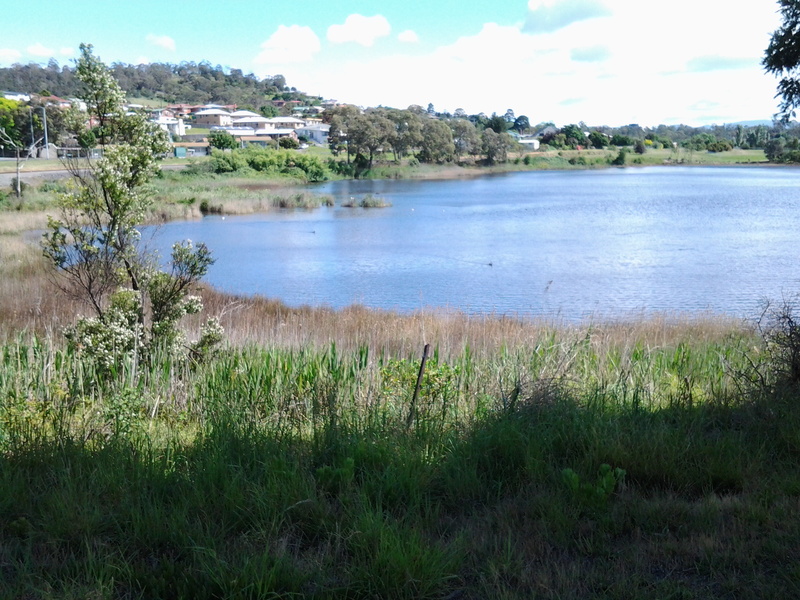 At 9.56am I turned left and walked across the Park parallel to Rusts Bay, crossed a single lane wooden bridge and rounded the Shoobridge sporting fields all the while enjoying the pleasures of dogs walking their owners along the edge of the Derwent River. The photo below shows Shoobridge Park on the northern side of Beedhams Bay. I was amused and somewhat puzzled watching a Pied Oyster Catcher picking for worms on the sports oval, and not bothered by an interested German Shepherd. What happened to a little fear? What’s wrong with oysters? I had an easy walk on mowed grasses to Beedhams Bay and was delighted when a White Faced Heron flew onto the path ahead of me. Slender. Petite. Soft grey. At 10.10am I crossed the railway line following the tracks of others but there are no official paths. The Main Road was again to my right with the railway line to my left. Native Hens were feeding ahead and noisy plovers let them know I was coming. Black swans floated on the Bay. I noticed bus stop 40, and realised 1 ¾ hours had passed since I started today’s trek from bus stop 47 in Granton South. While at Beedhams Bay I was in full view of three mountains: Mount Direction on the eastern shore, and Mount Faulkner and Mount Wellington on the western shore. I stopped for a morning tea break at 10.18 in a gazebo at the southern end of Beedhams Reserve. Despite some protection from the elements, the food was blown off my spoon before I could transfer it to my mouth. My hair thwacked back and forwards at every angle across my head creating an interlocking mesh. The photo below shows Beedhams Bay looking northwards across it. My maps indicated that the nearby building sunk low in the earth was a scout hall but I couldn’t see signs of identification and the building looked locked up and unused. Foot tracks emerged from the area and crossed the railway line that cut through between packs of houses on either side. 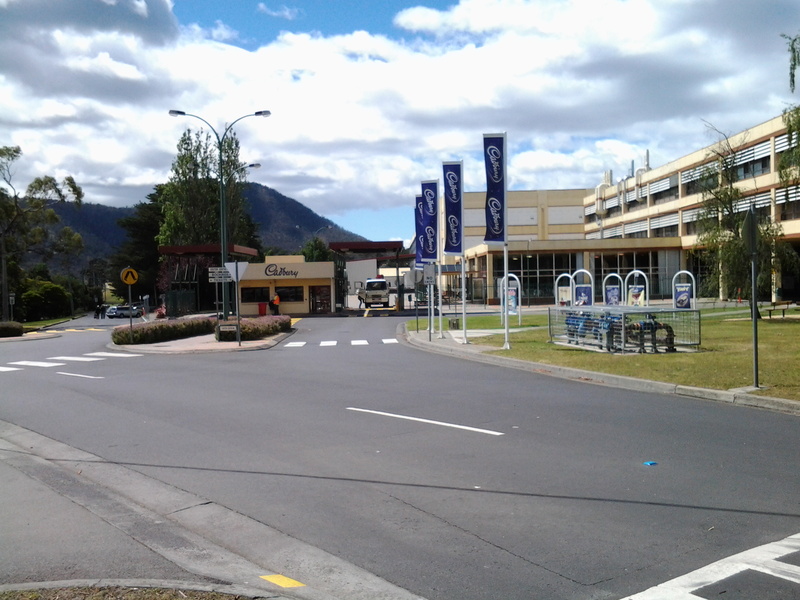 There was no evidence of being able to continue to walk close to the Derwent River so I walked up above but beside the railway line until I reached a road crossing at Bilton Street in Claremont. 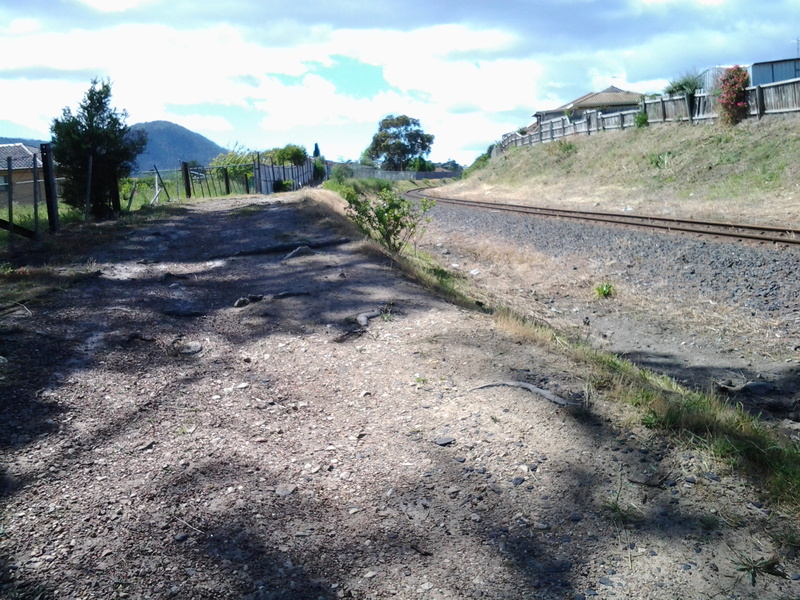 A local government bike and pedestrian path from Hobart reached its conclusion next to the railway line on the other side of the road. To my surprise Claremont Plaza, a multifaceted shopping village and other organisations, was located in the block diagonally opposite. This was a sensible location to make a toilet stop since there are no public toilets available during my 9th stage of the walk along the Derwent River. By 10.46am I had returned to the rail/road crossing ready to continue the walk. I followed Bilton Street around the curve until its T junction with Cadbury Road and turned left. On the other side of the road, the lovely red brick unused old Claremont School stood boarded up. The road turned uphill and passed the Bilton Bay Reserve (10.49am) and the entrance to the Derwent Waters Residential Club – an estate signed as private property thereby denying my access to the River’s edge (10.56am). I continued walking on Cadbury Road flanked by tall pine trees thrashing in the wind, past the Cadbury Sports Grounds (11.05am), past the Cadbury Visitors Car Park (11.08) and turned left onto Bournville Road. I knew I would be returning to have a closer look at the Cadbury chocolate confectionery manufacturing factory so I proposed to walk to Dogshear Point first and then be rewarded sweetly later. 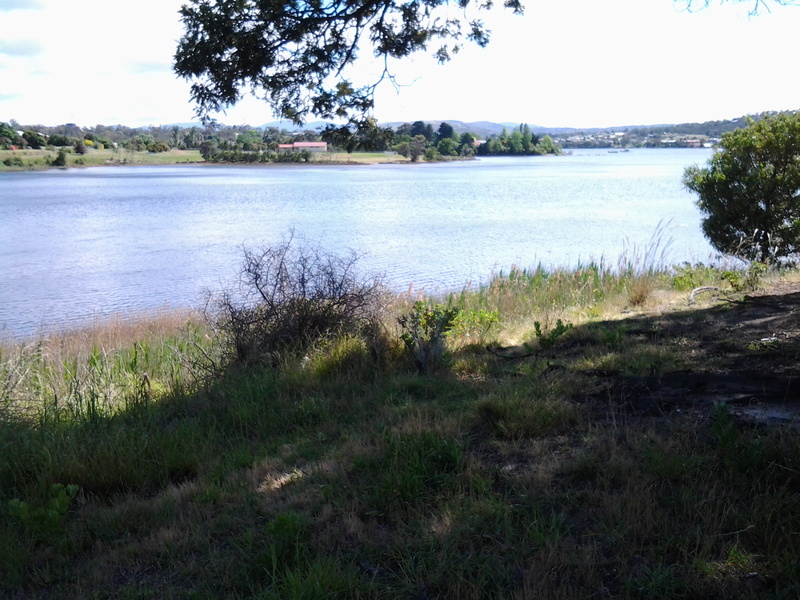 This entry was posted in Derwent River, Hobart, Mount Wellington, Walking and tagged Austins Ferry, Beedham Bay, Beedham Reserve, Bilton Bay Reserve, Bournville Road, Cadbury, Cadbury Sports Ground, Claremont Plaza, Derwent Waters Residential Club, Dogshear Point, Ferry Road, Harbinger Lane, Mount Direction, Mt Faulkner, Native Hen, Pied Oyster Catcher, Plover, Rusts Bay, Shoobridge Park, Weston Park, White Faced Heron on November 28, 2014 by Tasmanian traveller.